system consisting of the MP1 “master” controller and individual MT1 “slave” terminals at each modular boiler unit. The master controller monitors steam demand through a steam sensor at the header and utilizes sophisticated software to optimize the staging sequence of individual boilers for best overall system efficiency. The MI system software includes a variety of pre-set controls for load management of a diversity of applications with additional potential for customization of settings to precisely match sitespecific requirements. 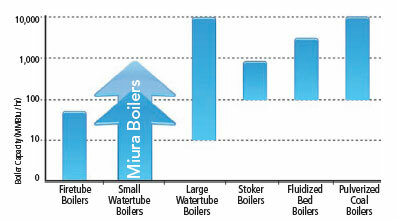 Whether you’re seeking to address small, point-ofuse applications or larger centralized/district energy applications, a Multiple Installation of Miura boilers is the answer. A single MI master controller can handle up to fifteen linked modular boilers with outputs of up to 150 MMBtu/hr (4,500 BHP). For larger applications, several controllers can be linked together. By utilizing multiple, linked master controllers, there’s virtually no limit to the size of the application that can be accommodated by a modular array, and do so while optimized for the highest possible efficiency.